More of a technique than a recipe, here’s the method we use for marinating red meat in oil. This recipe works particularly well for Kobe beef, grassfed beef, and beef-like game meats like bison, ostrich meat and kangaroo meat. 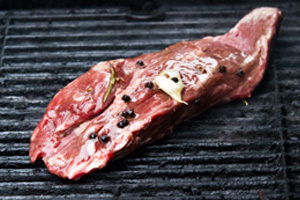 Pretty much any meat cut can be marinated, though skirt steaks & flank steaks absorb marinades particularly well. Use just enough oil to cover the meat cuts you’re marinating, and vary the quantities of other ingredients based on how prominent you want their flavors to be in the finished dish. 1. Crush the garlic cloves with the flat of your chef’s knife, but don’t bother peeling them. 2. Combine all ingredients in a saucepan and bring just to a simmer. Remove from the heat and let cool completely. 3. Pour the marinade over your meat in a zip-top bag, and place it in a bowl (to protect against drips) in your refrigerator to marinate for several hours or (preferably) overnight. Variations: Try adding cumin or paprika/pimenton to bring some heat to your marinade.